And this one was a gem, a model of the fabulous building constructed from Hermes boxes, very cool, love that orange it THE happy colour! I have been itching to see the "Liberty in print" event ever since Wee Birdy posted about it. The "Betsy" print was used to great effect to wrap the back of the building on Carnaby Street, more on this later. On the top floor they had this brilliant shed, each board covered in Tana Lawn, so joyous! Now, I don't know how Hen (Henhouse) manages to take her shop pics but I am so scared of being castigated by someone fierce in horn-rimmed specs this picture was really daring of me! Back to the building wrap! (Sorry Mr.Lane, I will of course consult on the pattern). Ah, it was all just as magical as I hoped it would be I saw many many trinkets and treasures which I have noted for Christmas presies for loved ones. On the way home at Victoria I bought a magazine to read, and it had to be this as I just Love Rob Ryan and the cover is by him. OK, OK I'll cut to the chase. 4 Beautiful Tana lawn lengths and several metres of this luscious velvet ribbon. What are you going to use it for S-J DTL? Well, the Tana lawn is going to be used to trim some old favourite cardis and sweatshirts. Elbow patches and such as well as becoming dresses for some dollies I am working on. This ribbon is a beautiful blue which I have named Midnight. You decide.......leave me your votes! I like both, foxy/Mr.Men I just can't decide so I shall be guided by you clever ones reading this! Oh and then I got really carried away with those fairies again! and decided to update the white tennis shoe! Crazy I know but I like it! So, it has been a really fun day and I am looking forward to more customising and frou frou. I’m going to go with midnight…but I do like them both! Those flowers outside the shop look lovely. If only I could have picked some out from the picture. My OH is on his way up too London now, he did ask if I would like to go…he is working and the shops will be shut. I had much more fun coming along with you. PS. Your shoes look fab!!! You could always crop those jokers out! I'd have to go for Cadbury, chocolate gets my vote any day! 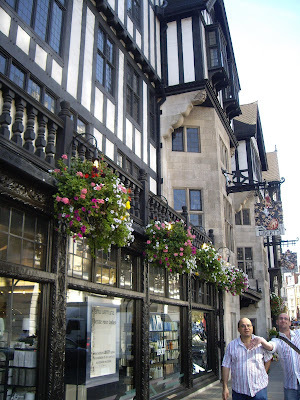 Ooooh, it looks gorgeous, I really must get along there, if only to see the back of the shop all flowery. I think I have come down on the side of Cadbury though you are a hard woman, making us choose! I have the lilacy flowered fabric, it's so pretty but I am hankering after the little blue flowery one. No no, stop, I am not to buy any more fabric. Am I? Thanks for the virtual shopping trip. P.S. I just take the photos, they've never asked me to stop...YET! Oooh Midnight, sounds dark exciting,starry a bit dangerous a lot romantic. Mmmmmm but Cadbury means........ CHOCOLATE! well after that no contest really it will have to be cadbury! Loved your photos, love the decorated back of the shop amazing. Have fun with gorgeous purchases. And I love your customising too, real funky. 'Ooohhhhhh' that is a difficult one. My taste buds are screaming Cadbury's but I think I prefer Midnight. Though here's one to throw into the pot - all the cool kids this summer have been wearing odd laces with their trainers/Converse/pumps - maybe you could go for that look! OOh lovely! I like the midnight best I think but both are gorgeous. I hope you are going to show us your updated clothes too, I love what you did with the ribbon and I have to vote for Midnight. Yes I too want to see how you upcycle your cardis. I've covered buttons in Tana Lawn and put them on my thrifted cashmere cardigan but would love some inspiration as I have a stash of Liberty fabric waiting to be used! Looks like you had a lot of fun, hope to see the redone cardis. Those shoelaces are fabulous, I think i prefer Cadbury. Glad you had a nice time. Hello my Liberty Lawn Lovely! Infectious liberty lovin' going on here! My vote ~ midnight in one shoe and Cadbury in the other! What a great day out! I haven't been there in ages! I like the Hermes diplay. I love their scarves, when I was single I used to treat myself to some. Now I focus on home things more. 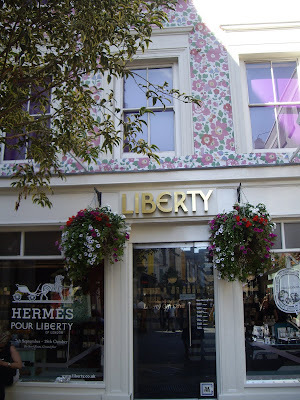 The exterior of Liberty is fabulous, what a great idea! I wonder if it's a trend that will catch on? Darling thank you so much for taking us on this tour, much appreciated. I vote for Cadbury!! Luv, thank you for visiting me and for the sweet comment you left behind, you are so kind. Your blog is also on my list of beau-TEA-ful friends blog and I will proudly follow you whereever you go. THank you for sharing! All so very lovely...especially the building wrap...Wow! What lovely things you bought! And Lovely photos too! I have just found you from Florence and Mary and am looking forward to seeing more! Oh sweet Liberty.. my mother and I would go there for a special treat when I was a lass.. I loved nothing more than to stand on the top floor and peer down the stairwell at all the different departments.. Mum even made me a long Liberty lawn dress.. wish I still had it... though might be a squeeze! 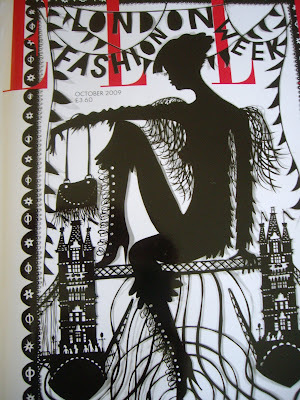 My vote is for Midnight.. dark, dusky and so richly plush..
Ooh I do love that shop! Love all your purchases the Midnight is beautiful.I visited Liberty a couple of weeks ago too and posted some photos of the flowery wall outside. I wasn't as brave as you and didn't dare take any photos inside so well done ! The prints on the fabric you chose are lovely.